Very simple snakes and ladders type game. 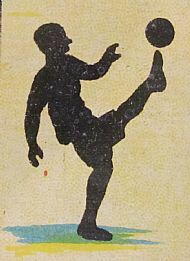 No box and looks like a 1940s or 50s game. Simple dice and counter gameplay. 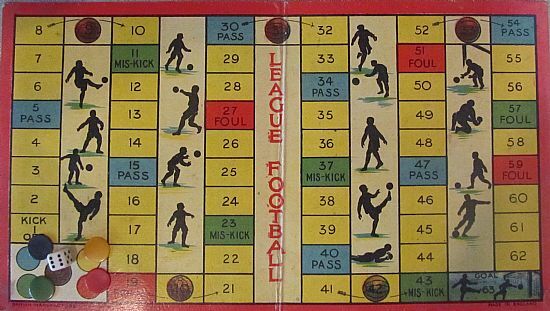 No rules so who knows what perils befell you if you land on 'Miskick' 'Foul' or 'Pass'. Almost identical to Ding Dong. Simple card board playing surface with dice and counters. 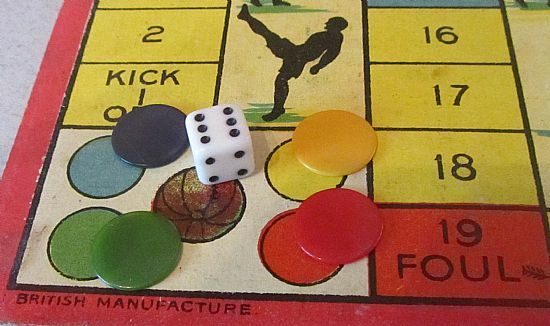 Four counters in the traditional red, blue, green and yellow colours plus a dice. Unusual end space numbered 63! Probably just made to fit into the design nicely.